Why use The Oven Maiden? The Oven Maiden will restore your oven to its former glories by using non caustic and environmentally sound chemicals. The Oven Maiden is fully insured and will arrive at the agreed time. When it comes to oven cleaners in Ashford Kent, The Oven Maiden's service is second to none, this not only includes the quality of the equipment and chemicals used to clean your oven but extends to courtesy and cleanliness around your home. Before your oven clean begins a tarpaulin and a waterproof mat will be placed on your kitchen floor. The purpose of which is to prevent any carbon or any other deposit from being ground into or staining your floor, as an oven cleaner in Ashford Kent the day job is a messy business! Some oven doors will require a great deal of scrubbing the result of which will be the fact that you can once again see what your cooking! During the cleaning of your oven doors, the tarpaulin and matting will protect your floor from flaking carbon. Following your professional oven clean any carbon or deposits of any kind will be wrapped in the tarpaulin and taken away, leaving both your oven and the kitchen floor thoroughly clean. The Oven Maiden will pay just as much attention to the outside of your oven. Often the results are astonishing, the cleaning materials she uses are created specifically for professional oven cleaners with the sole purpose of restoring tired-looking stoves to their former glories; stainless steel is made to shine once more, cooker tops and extractors are left looking almost as new as the day they were purchased. Looking for professional oven cleaners in Ashford Kent, contact the oven maiden you can be assured of a friendly top quality service, respect will be shown to your home and kitchen and most importantly you will no longer be filled with a sense of dread when using your oven. 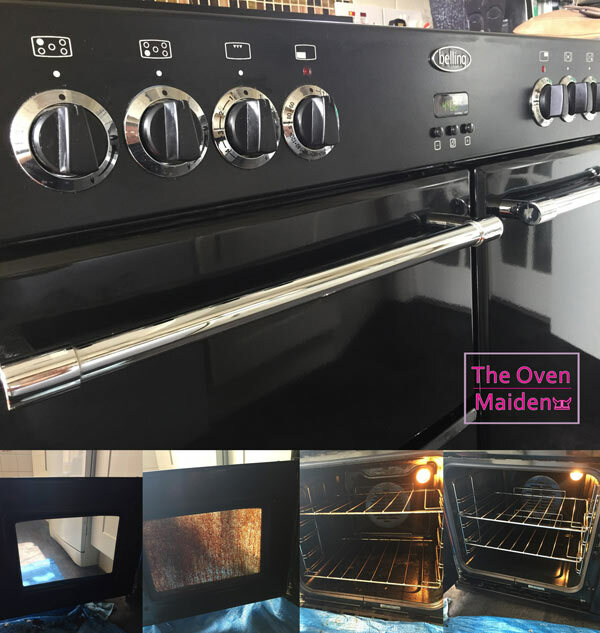 The Oven Maiden is your local female oven cleaner in Ashford Kent, Canterbury, Tenterden, Folkestone, Hythe, Maidstone, and the surrounding villages. she uses the latest equipment and environmentally friendly products ensuring a high standard of clean is produced time after time.